The International Judging and Officiating accreditation course is conducted usually over a day in a formal teaching venue. After completion of the course, and following all of the course requirements, participants of the course gain an immediate recognised qualification. The course takes approximately 7 hours with participants receiving - The Surfing Australia Educational package which consists of: Full colour International Judging manual, workbook, news and extra information. Course participants are accredited on the day of the course as a Level 1 club Judge. 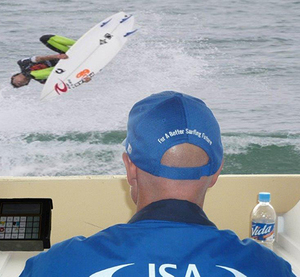 The International Judging and Officiating course enables successful course participants the opportunity to work as a judge and/or officiate at regional, state, national and international surfing/body boarding events. The judge will be registered with Surfing Australia as an accredited Level 1 club official. This will enable you to officiate at club events. Payment of the annual registration/reaccreditation fee ($30) will include the judge on the National Officials database and you will receive the official judge’s pack which consists of the current rulebook, personalised ID card, Surfing Australia news and information. The judge will be registered with Surfing Australia as a State level 2 judge and official and the Australian Sports Commission. Payment of the annual registration/reaccreditation fee ($40) will include the judge on the Surfing Australia’s National Officials database and you will receive the official judge’s pack which consists of the current rulebook, personalised ID card, Surfing Australia news and information. A level 2 accreditation is the minimum requirement to judge and officiate at regional and state sanctioned surfing events in a paid capacity. The Head Judge must sign off on these hours on the provided diary sheet. You will be registered as an International level 3 judge & official with Surfing Australia, the Australian Sports Commission, the ISA and ASP Australasia. Payment of the annual registration/reaccreditation fee ($50) will include the judge on the National and ISA International Officials database and you will receive the official judge’s pack which consists of the current rulebook, personalised ID card, Surfing Australia news and information. A level 3 International accreditation qualifies the judge to officiate at regional, state, National and International surfing events in a paid capacity. If you have previously completed the International Judging and Officiating course within the last 3 years you may apply for re-accreditation. Following the below guidelines. To renew your judging qualification, click here. To download the annual registration form, click here. To download the RPL form, click here. Sign up to the Surfing Australia Weekly Wave and get sent the latest and greatest surf news and videos.